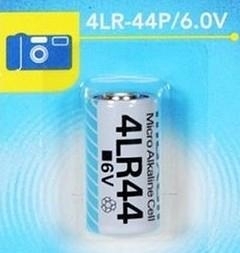 The 4LR44 Battery is a 6-volt alkaline battery that is high power and non-rechargeable. Some applications for the 4LR44 Battery are: camera photo equipment, glucometers, and medical equipment, electronic dog collars. garage door opener, pet containment system, remote controls, toys, pagers. The 4LR44 Battery has a shelf-life of 3 years, so keep a few extra in your toolbox. Most alkaline 6V battery being used are manufactured in China, and since it might be distributed many different brand names, when you want a reliable and high quality 6V battery, be sure to buy from a reputable supplier! Advantages︰ This 6-volt alkaline battery is primarily used to power photo equipment, garage door opener, glucometers, and medical equipment. Also compatible with some electronic dog collars & invisible fence systems. It’s a 6 volt alkaline battery (non-rechargeable). The 4LR44 goes by several other model numbers or names, such as: the PX28a, the A544, and the L1325.